Around the world, black handprints are appearing on doorways, scorched there by winged strangers who have crept through a slit in the sky. In a dark and dusty shop, a devil’s supply of human teeth grown dangerously low. And in the tangled lanes of Prague, a young art student is about to be caught up in a brutal otherwordly war. Meet Karou. She fills her sketchbooks with monsters that may or may not be real; she’s prone to disappearing on mysterious "errands"; she speaks many languages not all of them human; and her bright blue hair actually grows out of her head that color. Who is she? That is the question that haunts her, and she’s about to find out. When one of the strangers—beautiful, haunted Akiva—fixes his fire-colored eyes on her in an alley in Marrakesh, the result is blood and starlight, secrets unveiled, and a star-crossed love whose roots drink deep of a violent past. 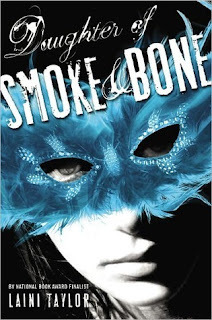 But will Karou live to regret learning the truth about herself? By the end of this novel, I was really loving this book, but it took me a while to get to that point where I was truly enjoying it. Honestly, it was kind of weird at first. I didn't understand what was up with all the chimaera. I was confused by Karou's connection with them and it took a while to figure out what was so special about her and why she had to be their messenger. I also thought the connection between Karou and Akiva was super silly because it was instantaneous, but that was later explained and then I was okay with it. Also, the initial setting was Prague, which was SO cool! Loved that aspect. Karou and Akiva were very interesting together. I was definitely puzzled by them, and sort of still am. Their ship wasn't very hot, but they still were an interesting duo to read about. And without giving any spoilers, I will say that there were a few parts with them that couldn't keep a smile off my face. A negative of the story for me was that some elements introduced in the beginning and presented with such importance didn't play a large role in the end. For example, Karou's art school, Karou's ex-boyfriend, and the weird little quirks about her that pertained to the chimaera. I assume they were all added to set the foundation of Karou's home, personality, artistry, and life as well as indicate her interaction with her chimaera family; however, these facets were completely dropped from the book before midway and it was just unsettling. The cliffhanger at the end was torturous! I was so frustrated with it that I started laughing! I just couldn't believe it ended the way it did. Despite my frustration, it was a great note to end on because now I must continue read the sequel! 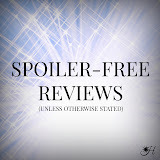 Recommended for readers who like: high fantasy, unique writing styles, a little romance mixed in the big plot. Learn more about Laini Taylor and her books on her website and Goodreads! I love Laini Taylor's books! I completely agree with everything you said about how all the pieces took a while to fit together but clicked really well in the end. 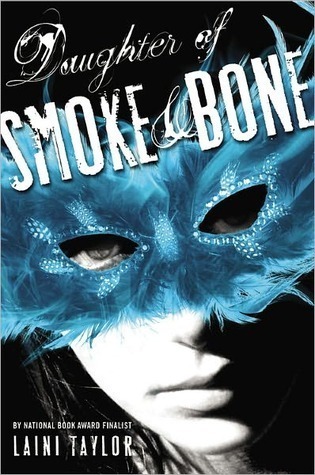 I really liked Daughter of Smoke and Bone, but I liked the second book even more. It's a lot darker, and you get to see so much more of the chimaera and seraphim. I was wishing for more about the chimaera and seraphim in the first book, so that excites me to know that there's more of that in the second book! Thanks for commenting! I've been waiting to read this one until I got the second (which I will this week). Glad you like it!